It's week 4 already (where's January gone in such a hurry, huh?!) 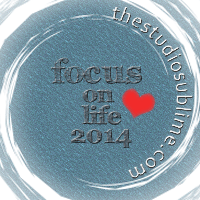 in the Focus on Life:2014 weekly photography challenge created by Sally from The Studio Sublime. "There are so many words, a simple grouping of letters that bombard us everyday, that impact our everyday life. They make us think, effect our purchasing of items and influence how we view ourselves. This week we will focus on words. What word speaks to you, makes you laugh, makes you feel good about your being and who you are in that moment. Is there a word that stands out, you find interesting, you think is fun to say." Side Note: (OPTIONAL PROMPT ALTERNATIVE) This photo prompt is about words in general and I know a few of you choose a word as a guide through the year. Please feel free to use your "one little word" for this prompt if you would like. I kept seeing words all week that caught my attention. I think John Lennon said it best. 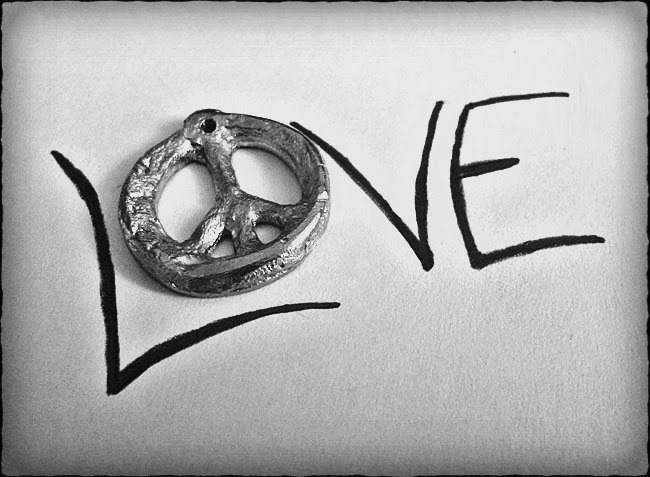 I wrote the letters and used one of my hubby's hand-poured pewter PEACE pendants for the 'O'. I then photographed it and edited it by playing with textures like Sally showed us this week! It was a fun little project! Peace and Love, just perfect! I love the pendant as the O and that lovely torn texture around the edge. Your word and images take me back to my younger days. Love how you put it all together . Shel - love the pendant AND the editing. It would make a great greeting card or even a cool way to package the pendant. Wonderful! Great choice, beautiful picture, perfect! A warm heart on this cold morning. :) The Beatles reference makes me happy...I saw the Cirque show in Vegas with my mom a couple of years ago and it's my absolute fave!!!!! I think Paula's idea is great print a card that size and attach the peace symbol!... I used word to create my word... Play on word(s)? You are right Shel. Love is the most important thing in our lives. Excellent choice for this weeks prompt. Wonderful idea to address this prompt. Beautiful pendant and so much meaning in the word. I love that you used that peace sign as the O. And now I have that song in my head, which is not a bad thing. Love is a great word. I like how you laid it out and captured it in a photo. How very true and I love how you created your word. Perfect and I love that pendant, if is so cool! Beautiful! and how very true. Shel, great play of words and choice also.